Vision of Abyssea, released June 21, 2010, was the first of three battle add-on scenarios for Final Fantasy XI. 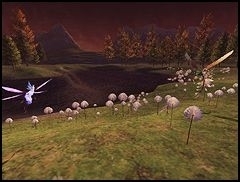 This add-on was preceded by three add-on scenarios which introduced new storyline missions; unlike those add-ons, the purpose of Vision of Abyssea is to introduce new battlefields into the game. Unleashed in conjunction with the Walk of Echoes, Vision of Abyssea signifies an effort by Square Enix to provide more battlefield challenges to casual gamers. Players in Abyssea can participate in battlefields, hunt notorious monsters and complete other quests. There are few requirements for participation. The Visions of Abyssea add-ons introduced three new zones into the game; these include Abyssea-La Theine, Abyssea-Konschtat, and Abyssea-Tahrongi. 1. Head off to Port Jeuno for a Cutscene. Entering Port Jeuno with a character level 30 or above will trigger an event scene, after which players will receive their first mission offer along with a "traverser stone" key item required to journey to Abyssea. 2. Proceed to the NPC Joachim in Port. After watching a cutscene you will be given the option to get a Traverser stone. Traverser Stones can be collected every 2 hours up to 3, and then 4 once certain requirements are met. These stones can be used all at once or at your discretion, each stone granting 30 minutes. 3. Once you have your stone the proceed to one of the the following zones. La Theine, Tahrongi Canyon, or Konschtat Highlands. You will find a maw located in each zone next to the nations starter area. 4. When your group is ready click the maw, and you will be teleported into the Abyssea zone. Once inside you will have 5 minutes to talk to the Conflux Surveyor to obtain visitant Status. Once Visitant status begins you will have 30 mins or more time available depending on how many stones you used. If you have multiple stones but do not sue all of them at once, you must wait 1 hour before re-entering Abyssea. Each stone gives 30 minutes of time within the area, with a maximum of 120 minutes. Only three stones can be used initially, for a total of 90 minutes. It is possible to expand the number of stones you can carry to four stones, for a total of 120 minutes. Note: You are allowed to exit your current zone and travel to another area and enter that zone under the same clock you started in the original zone. 1. There are Veridical Confluxes scattered across the zone and are used for easy transportation once you have payed have visited them and payed the fee they require to activate them in Cruor. Once activated, you pay pay another small fee in Cruor to teleport out to them from the base camp, Teleporting to base camp Veridical Confluxe #01 is free of charge from any other Confluxe. 2. Along with the Veridical Confluxes there are Martellos, located near each each Confluxe. These allow for HP and MP restoration and removal of status effects. These Martellos are run off a special fuel that must be replenished by doing a quest granted from the Machine Outfitter at the Main Base. You have an option for transporting the fuel or transporting additional tanks to these Martellos (must be done separately). Logging out, or leaving the area will cause this quest to be ended. Zones are not laid claim to so anyone is allowed to enter. Upon engaging a mob, battle proceed as normal, only 1 party or alliance can lay claim to a mob. Adventurers in Abyssea will face a challenge that is constantly adapting in accordance with their abilities. The strength of Abyssean monsters and the frequency with which they appear will vary based upon the party's level and the speed with which similar foes have been dispatched. High-level parties will draw the attention of even more formidable fiends, and slaying foes in short order will see the equally rapid arrival of reinforcements. Enemies often drop treasure chests. Monsters with a glowing aura award a larger amount of experience points. It has been noted the aura does increase when rapidly killing monsters, and decreases when you slow down or stop. Also its been reported that NM's seem to spawn randomly in groups of mobs after people start fighting them, which leads me further to this conclusion. EXP and Cruor are granted when killing monsters. Higher level monsters grant more of both, while NM's and "Glowing" Monsters can drop double or large amounts. Also killing monsters enables items to be distributed into loot pools as well as the possibility of chests appearing. There are different colored chests, some grant temp items, some normal items, some cruor, and some are traps that will spawn a mimic. This NPC will allow you to use the Cruor you have collected for various items. In addition to these enhancements, further, more specific enhancements can be obtained through the acquisition of key items known as Atma and Abyssites that can be obtained through various methods. Partial credit to Gwynplaine on BG for the list. This page last modified 2010-11-12 15:28:37.